A cultivar of Camellia japonica L. ‘Corallina’, a hybrid raised by Chandler in 1819, has semi-double, dark crimson red flowers, sometimes with a white spot, to 10cm in diameter. [ICR]. ‘Bud large, obtuse, scales yellowish; flower three and a half inches in diameter, and often more, double, deep cherry-red, No.6; petals large, broad, not numerous, sometimes spotted with white; some stamens in the centre. 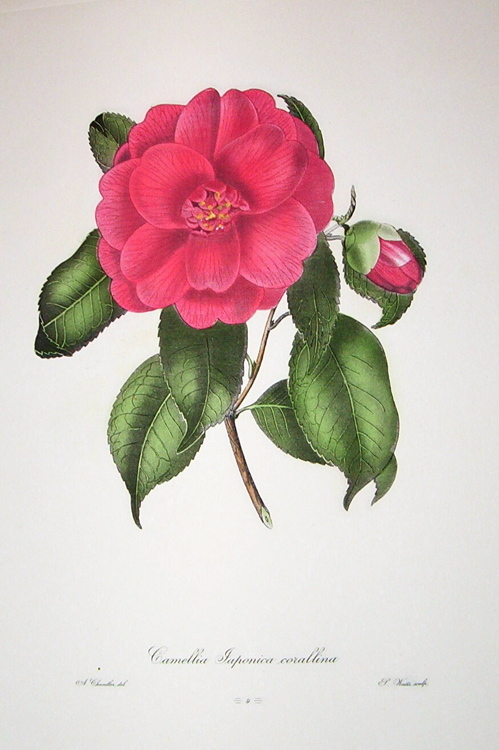 The seeds of this Camellia have produced very beautiful sub-varieties.-Superb.’ [Berlèse Monography p.75/1838]. ‘A very richly coloured and beautiful kind, possessing the additional recommendation of flowering more freely than some of the sorts.’ [LBC no.1586/1831]. Chandler pl.10/1831. Listed in all published catalogues [T.215/1843]. ‘Corallina’ is listed in both the 1830 and 1836 editions of Loddiges’ Nursery catalogue, copies of which are held at Camden Park [CPA]. In the 1830 edition it is marked with a ‘o’ indicating newly introduced and in the 1836 edition it is marked with a ‘c’ meaning grown at Camden. ‘Corallina’ was also marked ‘x C’ in an article by ‘G.A.L’ in the Horticultural Register. Although this book originally belonged to James Bowman and only later to Macarthur, this may indicate that it was grown by the Macarthur family earlier than 1843. [HR p.635/1832]. It may have been short-lived at Camden. Macarthur wrote to J. Graham of Melbourne on 17th July 1846 that ‘of Camellia japonica Corallina I never had but one plant and never offered it for sale. Mr. Fawkner must therefore substitute another sort for it.’ [MP A2933-2 p.178].